Looking for a tasty and easy dessert? I promise you that you won’t be disappointed with the current recipe. This Easy Icebox Cake with Dulce de Leche is the quickest dessert I’ve made lately. It contains only 4 ingredients (if we don’t count the decoration) and it’s unbelievably delicious! After I put him to bed at night I usually feel so tired that I can’t even imagine to do anything that requires high concentration and too much efforts. But when it comes to quick and easy desserts you don’t need to force yourself a lot. 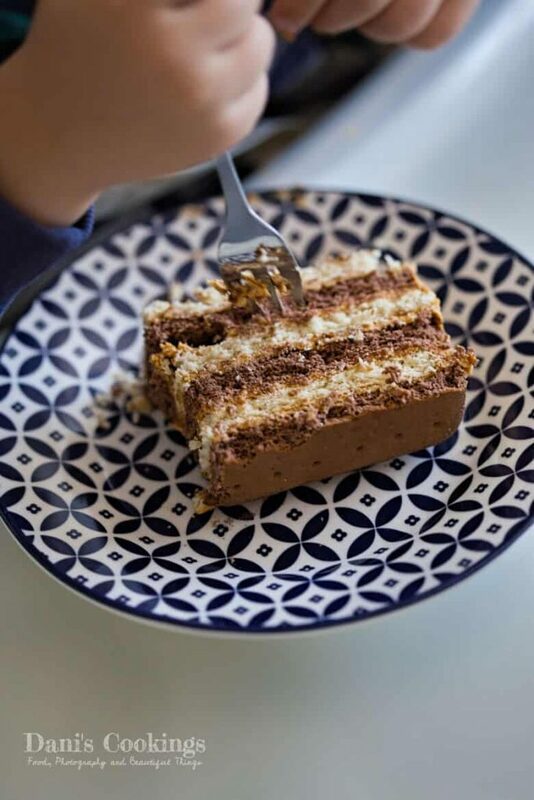 This is perfectly valid for this Icebox cake with Dulce de Leche which is so “lazy” that you can be sitting on a chair the whole time while preparing it. In fact even your kids can make it! But why is that cake so easy? The main challenge is to whip the cream and to mix it with the dulce de leche. I say “challenge” because many readers have reported issues with whipping cream – sometimes it doesn’t become stiff and this makes the frosting runny. For that reason I will state again all the important elements for a successful whipped cream: it has to contain nearly 30% fat; it must be cold (to stay at least 8 hours in the top rack of the fridge) and should be beaten at high speed until the moment it gets thick enough. After whipping the cream you need to fold it into the dulce the leche very carefully, ideally using a rubber spatula. It is important to keep the air inside the cream, that’s why you shouldn’t make abrupt moves when combining the two ingredients. When the frosting becomes uniform, you can assemble the cake! For the effect of this cake you need two kinds of hard rectangular cookies or graham crackers: plain and with cocoa. Each layer has a different colour and this makes the cake prettier. Also the frosting has a light brown caramel colour which looks even nicer between the dark and the light cookies. It takes about 30 minutes to prepare this cake from scratch. And if you make it in the evening, on the next day it will be ready for decoration and serving! With an electric mixer whip the cream at high speed, until very thick. Using a rubber spatula gradually fold the dulce de leche into the whipping cream. Depending on the dulce de leche’s consistency, the mixture might not be completely uniform but this is fine. Pour the milk in a plate and quickly soak few plain cookies/ crackers inside. Arrange them on the bottom of a rectangular serving plate or pan. Spread on top some of the frosting. Soak some cocoa cookies/ crackers and arrange them on top of the frosting. Continue the process until using all the cookies or crackers. Ideally the cake will have six layers (3 plain and 3 cocoa). Spread the remaining frosting on top and around the sides of the cake. Wrap the cake in cling film and transfer it to the fridge for at least 6 hours or overnight. Before serving decorate with cocoa powder and fresh fruits.